1945 built as VESTRIA for O.M. Thore, Johnstrop, Sweden. 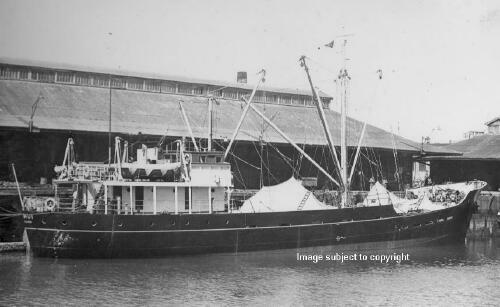 1949 sold to Northern Steam Ship Company. 1963 sold to Mr Suh Lee Kom of the Mayfair Rubber Com. of Singapore. 1962 December sold to Moh Yin Quek (Panamanian). 1970 sold to Eastern Shg. and Trading Co. (Pte.) Ltd. and renamed ARES (Singapore). 1978 sold to Yodpatankarn Co. Ltd. (Thai).